Philippe Starck is well known for his modern and playful designs and Mama Shelter may be his most playful to date. With five different room sizes you're sure to find the perfect fit. 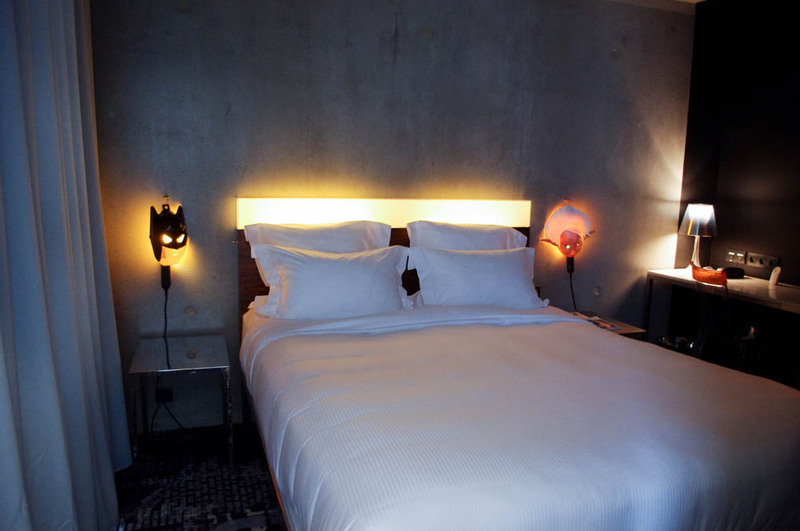 Each room has a quirky touches like masked bedside lamps, street-art inspired wall murals, and iMac's, complete with video games. Check out the bar and restaurant in the lobby where you'll find a the super cute Mama Pizzeria that serves up delicious Neapolitan style pies. The trendy bar area with it's large patio and designer cocktails fills up quickly each evening with locals and international trendsetters, so you'll be in good company. Although this hotel is what some would consider out-of-the-way in the 20th arrondissement, we actually relish any excuse to explore some of non-touristy neighbourhoods in Paris. The 20th couldn't be more lovely with it's tree-lined streets, corner pâtisseries, local coffee joints, and friendly locals. Plus you're only a 5 minute walk to the metro! The family behind Club Med run this chic little hotel, so service is always top notch. When it comes down to it no one takes care of you better than Mama right?